This topic describes how to set up your development workflow by defining phases and how to transition from phase to phase. ALM Octane uses phases to represent the status of an entity. For every entity, you can customize a workflow, indicating the phases through which the entity advances as it is being developed. Workflow is supported for any entity which proceeds through development, such as requirements, defects, tests, and so on. In isolated spaces, each workspace defines its own independent workflows. No elements of the workflow are inherited from the space. In shared spaces, the elements of the workflow are determined at the space level. These are propagated to the workspaces. Each workspace can define its own lower-level workflow elements within the inherited framework. This table summarizes the actions admins can perform when customizing workflows in shared spaces and associated workspaces. You can customize an entity's workflow in the shared space by creating, renaming, and deleting phases and transitions. When customized in a shared space, a workflow and its phases are available for the entity in all associated workspaces. Workflows created in a shared space act as a framework that can be expanded upon on the workspace level. You can customize workflows for a specific workspace. Customization includes renaming phases and adding phases. Transitions are added automatically. Phases from a shared workflow are displayed with the icon. For examples, see Shared workflows. While the workflow is shared, the changes made at the workspace level are available only to the one workspace where the changes are made. Only the admin for the workspace can access the changes made to the shared workflow. For details, see Shared workflows and cross-workspace reporting (Enterprise Edition). Shared spaces enable you to create widgets that report on information across workspaces. The resulting information is called a cross-workspace graph. Any entity that meets the widget's filter criteria is included in the graph, regardless of workspace. Cross-workspace graphs in the dashboard can display only information that is available to all the relevant workspaces. This means that any changes made in a workspace to a shared workflow are not visible in the cross-workspace graphs. Even if a shared workflow has been customized for a workspace, any entities whose phases were defined in the customized parts of the shared workflow are included in the graph. Limitation: If the cross-workspace widget configuration includes phases as the x-axis value, ALM Octane ignores entities whose phases were customized in a workspace. They are not included in the graph. For details on cross-workspace widgets using the dashboard, see Workspace . The workflow diagram contains the following entities. The phase represents a status of an entity. Different entities have different sets of phases. For example, backlog item phases include New, Deferred, Opened, Fixed, Proposed closed, Duplicate, Closed, and Rejected. If working in a workspace, an icon indicates that the phase is part of a shared workflow and defined in the shared space. You can customize the phases for each entity. For details, see Set up lists. When you create a workflow, the first phase in the workflow is the Start phase. A workflow has only one Start phase. Inside each workflow are Metaphases. A metaphase lets you categorize the phases logically. Metaphases are provided by default and cannot be modified. Within the metaphases, you can change the order and flow of the phases or add additional phases. If you select a phase in a shared workflow from within a workspace, the master phase field displays the original phase in the shared workflow on which changes were based. You can see the master phase field in the PROPERTIES pane on the right. If you rename a shared workflow phase in a workspace, the master phase displays the original name of the phase in the shared space. When adding phases in a workspace to a shared workflow, you add the phases relative to an original phase. The original phase is the master phase for any of these newly-added phases. For examples, see Shared workflows. Workflow phases are connected by transition arrows. A primary transition is the main workflow for the entity. Most entities will pass through the phases of the primary path as the entities are being developed. Each workflow has one primary transition. Transitions that are alternate workflow paths. These transitions are not essential to the primary logic of the workflow. Under certain circumstances, an entity will follow the alternate path. Example: Most New defects follow the primary path to the Opened phase. However, a New defect may be Deferred if there are not enough resources to handle it. Here are some sample workflows that demonstrate the use of phases and transitions. 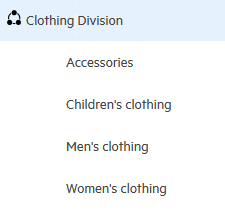 The admin for the workspace modifies the workflow for the Men's Clothing workspace. The admin adds two phases before the In Progress phase (Researching and In Design) and two phases after this phase (In Review and Testing). Because the changes are based on the In Progress phase, In Progress is the master phase. Only workspace users for that workspace can see these changes. To these workspace users, there are now five phases between New and Completed. The master phase, and any new phases directly or indirectly added to it, are handled as one unit in the shared space and in cross-workspace graphs. In this example, Researching, In Design, In Progress, In Review, and Testing are considered one unit based on the master phase, In Progress. If a shared space graph counts the number of tasks that are In Progress, the total includes the number of tasks in these five phases. In Settings > Spaces, select a shared space or workspace. Click Entities and select the entity for which you want to set up the workflow. Click Workflow. The existing workflow phases display graphically. Enter a name in the PROPERTIES pane. Enter a different metaphase in the PROPERTIES pane. In the display, the phase moves to the newly-assigned metaphase. Right-click the phase before which you want to add a new phase. Select Add Phase, and then Add a transition. Right-click a phase, and select either Add Before or Add After. The transition is added automatically. Tip: If you add phases with similar meanings to defect and user story workflows, use the same name for the phase in both workflows. This is because, in the Backlog module, the Backlog Items tab displays defects and user stories together. The phase filter for this tab includes all workflow phases for defects and user stories. Phases with the same name are listed only once in the filter. Right-click the phase before which you want to add a new phase. Select Add Transition. Enter the name of the target phase to which the transition should point. You can move a phase that you created on the workspace level before or after any phases that belong to same master phase, including master phase itself. Right-click the phase you want to move, and then select either Move Before or Move After. In the Move this phase dialog box, select the phase before or after which to move. Click the Primary Transition check box in the PROPERTIES pane. Right-click the phase or transition, and select the delete option. You cannot delete a phase if it has outgoing transitions, so delete those transitions first. You cannot delete a transition if it is the only incoming transition to a phase. If you delete a transition that is the primary transition, it is best to clear the Primary Transition check box before deleting it and to select a different transition as the primary one. Only space admins can delete phases defined on the shared space level. Admins for the workspace cannot delete or modify transitions created from the workspace on a shared space workflow. As you modify the workflow, it is refreshed automatically. You can create rules to customize workflow from the workflow diagram and also from the Rules settings area. You can define workflow rules for the currently-selected phase or the currently-selected transition. In the RULES pane on the right, click + to add a rule. 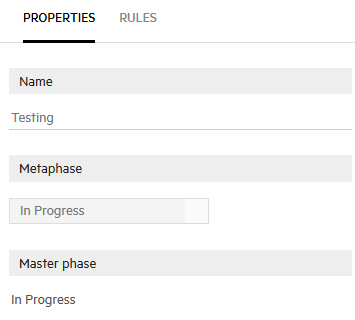 The RULES pane on the right displays rules for the currently-selected phase or transition only. For details, see Set up rules. Click Save in the RULES pane. 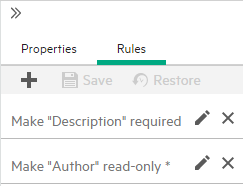 If you click the Rules tab at the top (not from the Rule panel), you see the rules defined for the currently-selected entity, including the rules you just created from workflow. You can add more workflow rules and modify existing workflow rules. The Phase column in the grid shows the phases for which you created the rule. These rules do not run for any other phase. This section explains how workflow rules can be shared across workspaces and be customized for individual workspaces. Workflow rules defined in a workspace are only available to that workspace. Workflow rules defined for shared workflows are available to associated workspaces. Workflow rules defined for a shared workflow can be customized for individual workspaces. Here we demonstrate how ALM Octane handles shared workflow rules and their customization. A shared space has the following workflow for quality stories. The space admin defined a Block Transition rule that does not allow team members to advance the phase of a defect from In Progress to Done. Only QA testers are allowed to do this. Rules with the Block Transition action prevent users from transitioning from one phase to a specific phase, even though the transition is generally permitted in the workflow for the entity. When the Block Transition rule runs for the workspace, it runs only on the first phase in the unit. As a result, team members cannot advance the phase of the defect from In Progress to In Testing. Added phases and their master phase are handled together by ALM Octane. When workflow rules, such as Make required or Make read-only, run for the workspace, the actions are applied to each added phase and the master phase. If the space admin makes the Done phase required in the shared workflow, both the In Testing and Done phases become required at the workspace level. Note: This is not true of Block Transition rules. In this case, actions are applied only to the first phase in the unit. For details, see Block Transition workflow rules.